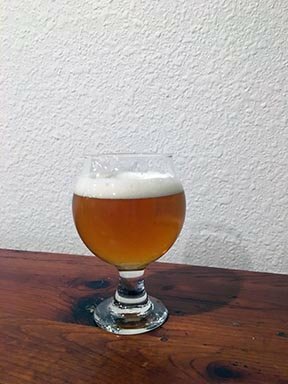 Over the last several months I've brewed a few iterations of Not a Citra Pale Ale, an American Pale Ale brewed with Millennium, Mandarina Bavaria and Ahtunum hops. The concept for the beer was to brew an American Pale Ale with citrusy American hops but to specifically exclude Citra. I was Citra'd out when I developed the recipe and I liked the idea of using hops that have Cascade in their lineage. I have been using Millennium for a bittering addition for both English- and American-style beers, so that made sense as an early addition. For finishing hops, I thought Mandarina Bavaria was a natural fit due to its "orangey" character. Ahtunum's grapefruit and geranium aromas would also make for a nice citrusy, floral nose on the beer. The grain bill is an APA base I've been using for a while. I occasionally substitute some of the name-brand malts with other options, but otherwise it's been a consistently good backbone for an APA. The inclusion of oats adds a slight haze but also makes for a nice mouthfeel. For yeast, I am partial to using an American Ale blend for a clean, quick fermentation with a mild amount of fruitiness. Englewood, CO water adjusted with 1.8g Gypsum for mash, sparge water pH adjusted to 5.5. The current iteration was brewed as part of the monthly All-Grain brewing class on 7/2/2017. If anyone has any specific questions about process or recipe design, please email me! Aroma: Moderate orangey/citrus hop aroma. Mild floral notes. Nice moderate malt background with a hint of sweet caramel aroma. Slight fruity aroma. Hop aroma could be a bit stronger as it requires a bit of swirling to blossom and dissipates quickly. Appearance: Light amber color with a white head. Foam stands nicely and is very appealing in the glass. Slight haze observed. Flavor: Moderate citrus and floral hop flavor without lingering bitterness. The orange hop flavor dominates the palate but is well-supported by malt. Slight fruity flavor from yeast, but not cloying sweetness or over-the-top fruitiness. Medium-dry finish that is clean. Mouthfeel: Medium body with moderate carbonation. Smooth finish. Overall Impression: Good color, really nice flavor but could use a little more hop aroma. Consider dry hopping future versions to bring out more hops. A good example of the style needing minor tweaks.